Discover how to be a seeker and teller of information. The need to be an effective communicator is extremely important in virtually every career field. While completing Alvernia University’s degree in communications online, you’ll develop the skills you need to effectively express ideas, allowing you to become more valuable in the marketplace. Our program provides you with the opportunity for networking and gaining real-world experience through the challenging coursework. Upon graduation, you’ll be able to pursue a variety of careers, including ones in journalism, public relations, marketing, advertising, theater, broadcasting and more. Through the flexible online format, you’ll have the convenience to study at your own pace from wherever you wish as you learn from faculty who have professional experience in fields such as print journalism and television reporting. Our online communications degree helps you strengthen your abilities in oral communication, writing, problem-solving, critical thinking and organization. The program requires you to complete either a research seminar, in which you’ll complete a project or an intensive study and research paper, or a specially arranged internship at a local business, television or radio station or advertising agency. Our communications online degree program also allows you to customize your degree with the choice of two tracks. Strategic Communication: Learn how to effectively communicate in today’s dynamic society with the chance to study the social and psychological impacts of communication. Public Relations and Advertising: Explore the various tools and techniques that today’s businesses use to communicate and market to the public. The online communications degree includes 123 credits, 31 to 55 of which make up the Liberal Arts Core. The major’s communication core requirements consist of 33 to 42 credits, in which you may choose between two tracks: strategic communication or public relations and advertising. 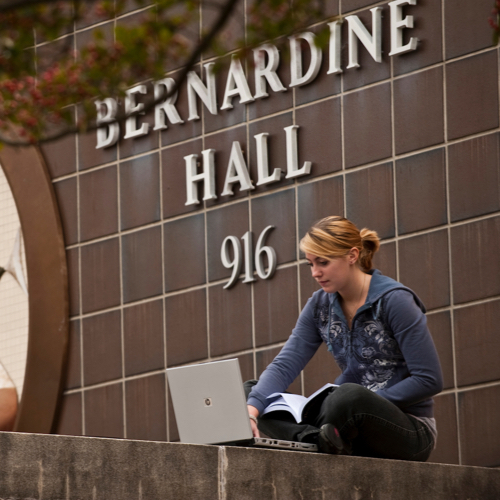 Within the major’s requirements, six credits of communication electives, nine credits of English credits and six credits of related electives are required. To fulfill the remaining credits necessary for degree completion, you must choose general elective courses. Introduction to interrelationships between contemporary American life and communication media. Includes a survey of basic theories, models, and practices of mass communication. Introduction to writing styles and format requirements necessary to write for various American media. Emphasis on process of gathering and writing news for print and broadcast media. This course meets the Writing Enhanced requirement. Study of legal and ethical framework within which mass communication media operate. Examines legal philosophy bearing on the mass media, the development of freedom of expression, and privileges and restraints affecting the media. Topics include the study of libel, invasion of privacy, copyright, contempt and government regulation. Basic course in the development of communication attitudes and skills with a view to enabling the student to feel comfortable and competent in public speaking ventures. Includes exercises in the oral interpretation of literature; the organization, delivery, and evaluation of various types of speeches; and participation in panels or symposiums. The course develops communication skills to empower students in feeling comfortable and competent speaking for virtual communities. This includes exercises in the organization, creation, and delivery of narrated slide decks, podcasts, vlogs, and webinars using web-based software programs and social media platforms. Qualified students may choose a creative writing project, a mass media or audiovisual production project, or an intensive study of a phase of communication that culminates in a significant research paper. For senior English or communication majors. By special arrangement, a student may be granted up to 12 credits for an extended assignment involving in-depth work in some phase of communication. Such assignments might include an apprenticeship in a TV or radio station, a position as reporter at a local newspaper, internship in the communication division of a corporation or non-profit agency, etc. Prerequisite: 2.5 GPA or permission of department chair. An introductory survey of basic theories, models, and practices of interpersonal communication. Students learn interpersonal communication principles, sharpen awareness of own and others’ personal communication habits, and ultimately improve interpersonal communication skills. This course introduces students to special event planning processes and techniques. Emphasis is on creating, organizing, identifying sponsors, marketing and implementing community and business events. A study of principles and applications of public relations in contemporary society. The course will include an overview of the relationship between the public relations practitioner and both internal and external publics. Topics include media relations, publications, crisis management, and the development of public relations plans/campaigns. Designed to introduce students to the processes involved in planning, designing, creating and copy-editing multimedia projects. Topics include design and layout principles for a variety of print and electronic publications, image and text manipulations, and editing for consistency and clarity. Facebook, Twitter, YouTube, LinkedIn and Pinterest — in order to stay competitive in today's world, companies and organizations need to implement social media into their integrated communications plan. This course will primarily focus on social media, but will also explore other facets of digital marketing. Topics to be covered include social media platforms, content development, multichannel integration, organic and paid search, mobile opportunities, web analytics and measurement, legal and security issues, crises, best practices and trending issues. If offered as a service-learning class, students will receive hands-on practical experience by developing a social media marketing campaign for a local non-profit organization. Advanced writing course oriented toward communication beyond the academic world. Assignments include correspondence, memos, resumes, proposals, oral presentations, and one or more major reports. Introduces students to current communication software, to familiarize with requirements of writing in their specific disciplines, and to help develop a clear, concise writing style. This course provides understanding and application of current interactive multimedia, exploring the use and integration of visual, textual, and aural components of digital environments. The challenges of writing for nonlinear and interactive texts are explored through online exercises, electronic presentations and publications, and web design. Investigates the principal research findings concerning the role of mass media in shaping the attitudes, values, and behaviors of our culture. Includes survey of advanced theories, models and practices of mass communication. In-depth study of factors that go into promotion and advertising campaigns. Students critically examine elements involved in planning, research, budgeting, public relations, media selection, creative concepts, message appeal, cost effectiveness, and legal constraints. Emphasis is placed on important role of promotion and advertising within the marketing context. Prerequisite: BUS 207 or permission of instructor. Examination of forces involved in small group interaction. Small group work sessions developed. Explores application of psychological principles and results of empirical research to the behavior of individuals in the workplace. Topics include organizational issues (e.g., work motivation, job attitudes, leadership, and organizational stress) and industrial issues (e.g., including employee attraction, selection, placement, performance appraisal and feedback, and ergonomics). Intrinsic connection between science and practice is emphasized throughout the course. Prerequisite: PSY 101, junior status or permission of instructor. This course aims to discover the different ways in which people interact with other individuals, groups, and the larger society. This course will include the research and theories regarding self and person perceptions, attitudes, social influence, prejudice and discrimination, interpersonal relationships, aggression, and altruism, in addition to applications of social psychology to health, law, businesses, and the environment. Prerequisite: PSY 101, senior status or permission of instructor. The course explores the concept of "the cloud," the use of computing resources that are delivered as a service over a network (especially the Internet). In particular, this course addresses how the cloud is the backbone of social media and how the cloud facilitates business communication and collaboration. Technologies studied range from smartphones to tablets to virtualization to cloud services such as storage and telepresence. Social and ethical impact of cloud technology trends are discussed and debated. Students plan and produce advertising programs for the college and/or nonprofit organizations; workshop-styled atmosphere. An introduction to the sales process including prospecting, lead generation and qualification, sales presentation and closing skills. Sales management focuses on planning, organizing, staffing and supervision of the sales effort. An examination of the decision-making processes of consumers and the social forces that influence consumer decisions with an emphasis on the implications of relevant theories and research findings upon the practice of marketing. Study of the elements and principles of design and experimentation in the physical, psychological and theoretical use of color as applied to two-dimensional design. Students will learn to conceptualize, visualize and organize original designs. Introduces students to the techniques, software, and materials used in graphic design. Emphasis is on basic design principles, layout, type, and integrity of image. These elements are used to produce final computer generated graphic solutions such as logos, flyers, ads and newsletters.